joy magnetism: Won't you come blog, joy magnetism? Dude. 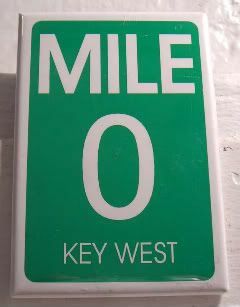 I'm glad I didn't get this magnet from Key West to send to you. Phew. I'm still debating on the parrot one or the aerial view one for you. Awww, I'm just happy you thought of me! If I have a choice, aerial might be best. Though, parrot can always be used for Jimmy Buffet. Eh, whichever, and thank you! !